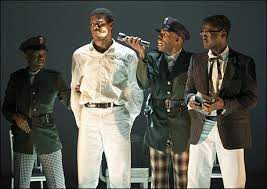 AMDA | AMDA News - Kyle Scatliffe nominated for London Newcomer of the Year! Congratulations to alumnus Kyle Scatliffe who has been nominated by the British publication WhatsOn Stage for their "London Newcomer of the Year" award! Kyle has been receiving rave reviews for his performance as Haywood Patterson in The Scottsboro Boys on London's West End and he will soon be starring in his first Broadway production, as Enjolras, in next year's anticipated revival of Les Miserables.